The U.S. 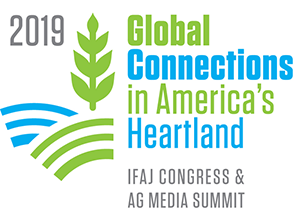 Farmers and Ranchers Alliance (USFRA) celebrated its seventh anniversary of helping provide a voice for agriculture on the national stage at the National Association of Farm Broadcasting convention in Kansas City last week. “There were six original organizations…we’re up to over 100 now,” said USFRA CEO Randy Krotz. USFRA elected four new board members at the meeting – James Adams representing the U.S. Poultry & Egg Association, Steve Geick with John Deere, DuPont Pioneer’s Amanda Rinehart, and Blair Van Zetten from the American Egg Board – to join the 18-member Board of Directors. 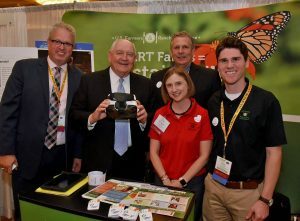 During the board meeting, USFRA showcased its consumer-facing activities in 2017, including SMART Farm, where USFRA used 360-degree video technology to bring the farm to the consumer at events like the Consumer Electronics Show and the South Beach Wine and Food Festival. “USFRA goes to places that a pork, or cattle, or corn or soybean organization would maybe not go by themselves,” said USFRA chair Brad Greenway, a hog farmer from South Dakota. Greenway says the SMART farm concept resonates with millennials and USFRA will be carrying it forward into 2018. Other programs and major initiatives for 2018 include the Food Evolution film promotion and enhanced distribution, as well as an exciting new app, engAGe, which aims to activate farmer and rancher voices on digital and social media platforms.